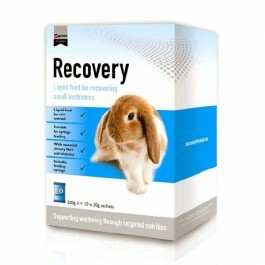 Supreme Recovery offers complete nutritional support for sick or recuperating small herbivores. What is Supreme Recovery and who is it for? Recovery comes in sachets that are rehydratable as a nutritionally complete liquid feed for sick or recuperating small herbivores. Just add warm water and mix into an easy to feed paste. It contains high fibre (19%) to help promote gastro-intestinal health and aid with faecal consistency. The formaula contains fructo-oligo-saccharides (FOS) prebiotics to help promote the growth of beneficial bacteria for digestive health, and includes 17% protein to help sustain protein reserves and support the immune system. Suitable for long-term feeding in rabbits. What are the benefits of using Supreme Recovery? What is in Supreme Recovery? How do I use Supreme Recovery?